Long defines his idea of art as “in the nature of things. Art about mobility, lightness and freedom. Simple creative acts of walking and marking about place, locality, time, distance and measurement. 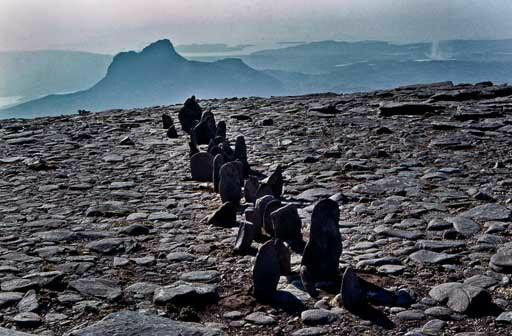 Works using raw materials and my human scale in the reality of landscapes.” (Richard Long official website). Among the major exponents of British land art, Long executes minimal actions on the territory, documented by maps, photographs and texts. The ‘walks’ that made him famous starting at the end of the 1960s (A line made by walking, 1967) were brief performances in natural settings where man, albeit not present in the subsequent documentation, established a relationship with the natural environment, leaving signs, a line on the grass, a stone circle, almost as if to create an intimate, reciprocal acknowledgement. He will use natural materials again in the 70s, to create large ‘signs’ inside vast museum spaces or galleries, for example spirals or lines that were interpreted both as archetypal references to prehistoric sculpture and as the desire to add a mental, human dimension to the ‘disorder’ of nature. The majority of art critics ascribes to Long’s works, unlike the work of other land artists, characteristics tied to the typical natural elements and materials of his land.